US Special Representative says Israeli TV report on “Deal of the Century” is inaccurate, says speculation on its contents is unhelpful. 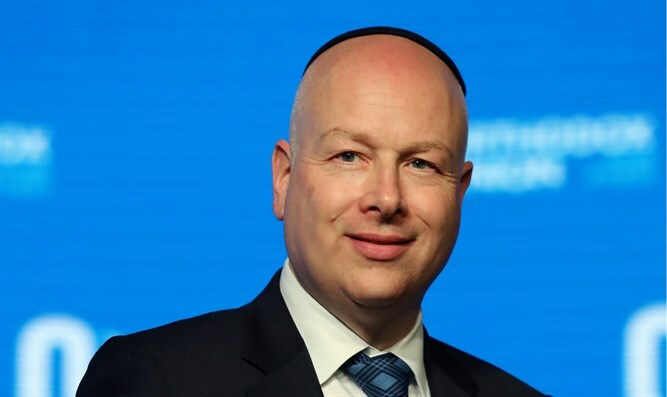 Jason Greenblatt, the US Special Representative for International Negotiations, said on Wednesday night that a report on Channel 13 about the Trump administration’s peace plan was inaccurate. “While I respect Barak Ravid, his report on Israel’s Channel 13 is not accurate. Speculation about the content of the plan is not helpful. Very few people on the planet know what is in it… for now…,” tweeted Greenblatt. “Over the coming period, unnamed sources will peddle narratives to the media and others based on motivations that are far from pure. Peddling false, distorted or biased stories to the media is irresponsible a harmful to the process. Israelis and Palestinians deserve better,” he added, noting that he “highly recommends” that people listen only to official statements on the plan from President Donald, US Ambassador David Friedman, Jared Kushner, or Greenblatt himself. …I highly recommend that people listen only to official statements directly from @POTUS, @USAmbIsrael, Jared Kushner, or me about the plan. The Channel 13 report, which quoted an unnamed American source, said that the peace plan formulated by the White House includes the establishment of a Palestinian state in about 90 percent of Judea and Samaria, with at least part of eastern Jerusalem as its capital. Under the plan, the Temple Mount, the Western Wall and the Mount of Olives would reportedly remain under Israeli sovereignty, but with full administrative partnership with the Palestinians. Ambassador Friedman recently indicated that the US will not be releasing its Middle East peace plan in the immediate future. ← What is Trump praising about Israeli security barriers?